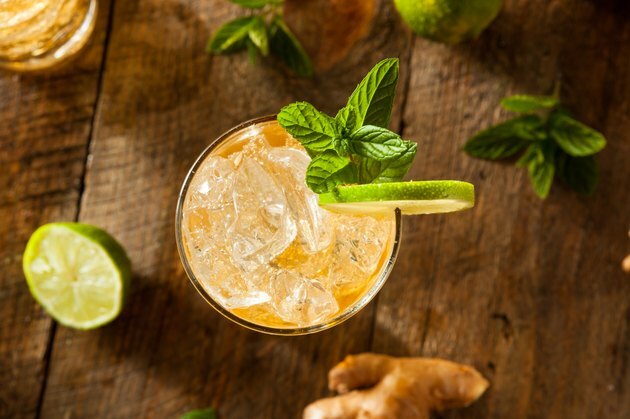 The name "ginger beer" can be misleading because, in most cases, the beverage doesn't contain alcohol, which makes it similar to ginger ale, a type of soft drink. Both beverages contain added sugar and don't have much in the way of nutrition, but comparing them can help you make the best choice for your health. Ginger ale is a carbonated soda-type beverage made primarily from water and ginger. Many ginger ales also contain added sugar. Ginger beer, on the other hand, is a brewed and fermented beverage that has a stronger ginger flavor than ginger ale. Neither ginger ale nor ginger beer contains any alcohol, despite their names. A 12-ounce serving of ginger ale contains 124 calories, no fat and almost 32 grams of sugar. That translates to 8 teaspoons of sugar, and that matters because women shouldn't have more than 6 teaspoons of added sugar a day and men shouldn't have more than 9 teaspoons, according to the American Heart Association. Too much sugar can cause you to gain weight, which raises your risk of heart disease. The same amount of ginger beer contains about 114 calories and 40 grams of sugar. Ginger ale and ginger beer don't supply impressive amounts of most nutrients, such as protein, fiber and vitamin C. A 12-ounce serving of ginger ale does supply 0.66 milligram of iron, which is about 8 percent of the 8 milligrams of iron men need each day and about 4 percent of the 18 milligrams women require daily. Ginger ale contains trace amounts of zinc and calcium, too. The most beneficial thing about ginger ale or ginger beer is that most varieties contain real ginger root. Ginger has anti-inflammatory compounds, called gingerols, which means that it can help reduce or prevent inflammation, according to the University of Maryland Medical Center. The ginger in ale or beer might help ease motion sickness, morning sickness and general nausea, too. Because both ginger ale and ginger beer are similar in terms of calories, fat, protein and fiber, the choice comes down to which one tastes better to you. Because the drinks do contain calories and added sugar, you should only have whichever one you choose on an occasional basis rather than making it a regular part of your diet. If you're interested in using ginger ale or ginger beer for nausea or another medical condition, always talk to your doctor ahead of time to be sure it's appropriate for you.